« Can you hear me now? 4D Sound is a blast at CES! So, the naugties are over and we’re heading straight into 2011. Over the next five days, I’m going to writing about what I think will be the next big tech trends this coming year. CES 2011 has already seen titles like “tablet wars“. The iPad has made the tablet form factor /the/ latest gadget to have back in 2010, and this year, a whole pile of Windows and Android based tablets are coming out making them even cheaper and more accessible. What does this mean? Well, most people have commented on how iPads are the perfect sofa companion. Its pretty common nowadays that for people to watch tv and use a computing device at the same time, and here is where I think home entertainment will rise to a whole new level. At MEX in Nov, I saw a presentation by Sofafantics – a startup helping to connect fans watching football matches. They wanted to make watching football at home more social: creating a public space where fans could comment on a match as well as providing a semi-private space for friends to comment too. A few years ago this would have been seen as absurd, but now, with smartphones and social networking, the entertainment business has never been more social. In fact, one of my favourite things during X Factor last year was to log into facebook and twitter during the performances to read other people’s reactions. 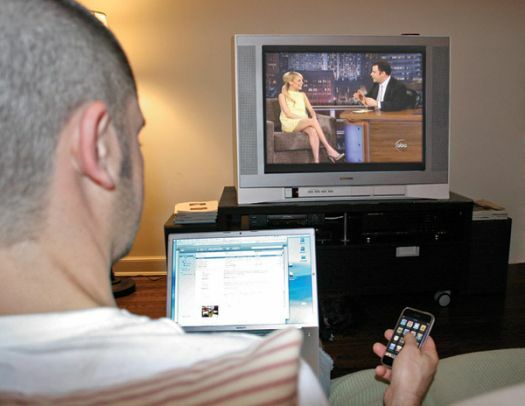 Another non-social example of the innovative use of the second screen was in the show ‘This American Life’. The iPad app which accompanied the series sync-ed when the theme music was playing, and provided the viewer with information about the characters and side plots to enrich the story. Often these devices were used to create irony, or suspense or to provide more background information in other to further flesh out the storyline. The second screen in the home has the potential to provide a richer, even more engaging medium for content creators. This year, I think TV companies will start embracing the second screen as a way to further engage audiences, especially at a time where TV advertising is falling. Kate – great article and you are 100% correct about the 2nd screen being a massive part of home entertainment now and in the future. In October 2010 there was an event called 2Screen (http://2-screen.com/) focusing on exactly this and even earlier than that a company called TellyLinks.com (http://tellylinks.com/) partnered with Five TV to provide information synchronised with what was happening on the show Numb3rs (http://en.wikipedia.org/wiki/Numb3rs). What excites me about this is that we need technology to be able to ensure that what we are seeing on our second screen is in-sync and relevant to what we are seeing on our home entertainment system (with the focal point being our TV). For pre-recorded events the delivery time of data and keeping that data in-sync is important. For things like X Factor up to 10 second or more delay potentially doesn’t matter. But for live events such as sport or anything that requires interaction then seconds really do matter. In all situations I believe that the sooner the data can be delivered the more relevance it will have leading to an improved user experience. For events such as sport it can be very difficult to automatically sync up information delivered to the second screen with what’s happening in the live event. Systems need to be built that allow super-fast (real-time 🙂 ) retrieval of relevant information to then be distributed to the 2nd screen (and even the main screen). Companies like Opta Sports, who have been involved in sports data for a very long time, still rely on a manual process in order to capture data. Therefore it’s absolutely essential that the time between that data being captured, that data being augmented and value added to it, and it being delivered is kept to a minimum. I think Kwwika is in a fantastic position to help others build those 2nd Screen applications that add massive value to our home entertainment experience. I totally agree about the importance of the 2nd screen. Interactive elements on the main screen add clutter to the TV experience and irritate for other people in the room (It’s basically like watching someone else browsing a website). Wholeheartedly agree! Every day seems to bring a new ‘second screen’ companion application or site. It looks like in the not too distant future, most shows will have some type of app to allow for more social experiences and deeper engagements. http://LivingOnTheSecondScreen.wordpress.com and invite others interested in the topic to provide guest posts. The field has huge opportunity and we look forward to helping spread the word and develop innovative new ideas around it. We require to be delicate to every other’s requirements and wishes. In case of an infection, some STDs can be easily handled. Warmth and dampness can cause injuries to the skin surfaces.